Features: Adopts water-resistant, breathable and crease-proof fabric. Inlcued pillow let you sleeping comfortably. Stop rolling off sleeping pad with 2 elastic straps on the backside. Pair perfectly w/ OutdoorsmanLab Sleeping Pads. Double-sided zipper with plastic handle, easy to use. No more snagged zipper with our full anti-sang layers on both side of the zipper. Split the double sleeping bag into 2 single ones if you like. Thoughfully designed carry sack with handle strap and extra pocket. Specifications: Temperature rating:limit at 32F, comfort at 42F. Perfect for Cool/Cold weather/temperature trip. Note: 1. Product color in the pictures may vary slightly due to the color calibration of each individual monitor setting, please refer to the real item you receive. Package List: 1 x Sleeping Bag 1 x Stuff Sack. 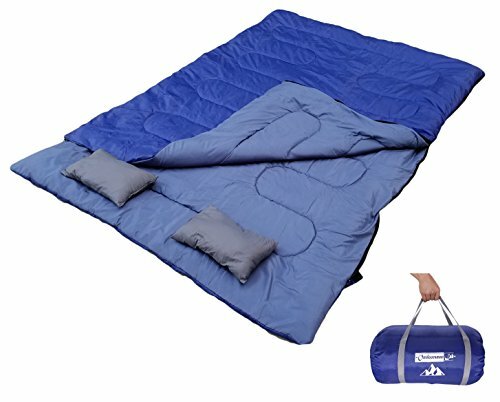 GET A GREAT NIGHT OF SLEEP WHEREVER YOU MAY BE- Don't settle for other low quality cheap sleeping bags! We are a U.S. based small business that strive to provide the highest quality products packed with innovative features designed with YOU in mind. We added sleeping pad straps so you will never roll off sleeping pad again. We completely redesigned the carrying bag so you can carry it easily! You can count on us for the very best customer service too! DESIGNED FOR EXTREME WEATHERS - Designed for comfort temperature ~45F and lower comfort limit ~37F w/ water repellent durable shell, quick dry soft liner. This sleeping bag is water-resistant, weather-proof, and super quick to dry to keep you warm even in extreme conditions and prevent you from any dampness. STOP ROLLING OFF SLEEPING PAD: Thoughtfully designed 2 elastic straps on the backside ensures you stay on your OutdoorsmanLab sleeping pad the entire night. Pair perfectly w/ OutdoorsmanLab Sleeping Pads. EASY TO CARRY WITH YOU: Specially designed carrying bag with extra holding straps and extra pockets to make you travel/Outdoor adventure just a little easier. If you have any questions about this product by Outdoorsman Lab, contact us by completing and submitting the form below. If you are looking for a specif part number, please include it with your message. Envelope Sleeping Bag for Adults, Boys & Girls, Teens， Lightweight Portable, Waterproof, Comfort with Compression Sack - Great for 4 Season Traveling, Camping, Hiking, Other Outdoor Activities. NTK KUPLE Double 2 in 1 Sleeping Bag with 2 Pillows and a Carrying Bag with Compressor Straps for Camping, Backpacking, Hiking.